Planning a trip to Germany and want some advice on what to see and do first? Here is a list of the top ten attractions and sights in Germany that no traveler should miss. The world's most famous castle, Neuschwanstein, is nestled in the Alps in Bavaria. It seems to come straight out of a fairytale; in fact, Walt Disney drew inspiration from it for "Sleeping Beauty." Neuschwanstein (which translates to new-swan-stone) is the most photographed building in all of Germany. King Ludwig II designed his dream castle in 1869 and instead of an architect, he hired a theatrical set designer to realize his vision. Take a tour through the flamboyant castle's interior. Highlights include a gaudy artificial grotto, the Throne Room with its giant crown-shaped chandelier, and the lavish Minstrels' Hall. Europa-Park, Germany's largest amusement park, recently unseated Neuschwanstein as the most visited site in Germany. It may not have the romance of the castle, but it does have mind-blowing rides, lands modeled on the different countries of Europe, and a mouse mascot that may remind you of someone else. More than any other landmark, the Brandenburg Gate (Brandenburger Tor) is the national symbol for Germany. Built in 1791, it was simply meant to mark the end of the boulevard, Unter den Linden. But the gate has had an eventful history. The gate is crowned with the winged goddess of victory riding a four-horsed chariot — which was stolen by Napoleon’s soldiers and taken back to France as a trophy in 1806. After Napoleon was defeated, Victory was returned to her throne in Berlin. After the wall fell in 1989, the Brandenburg Gate became the symbol of Germany's reunification. It might be a cliché, but it is an essential German experience of eating sausage and sauerkraut and drinking Oktoberfest beer. 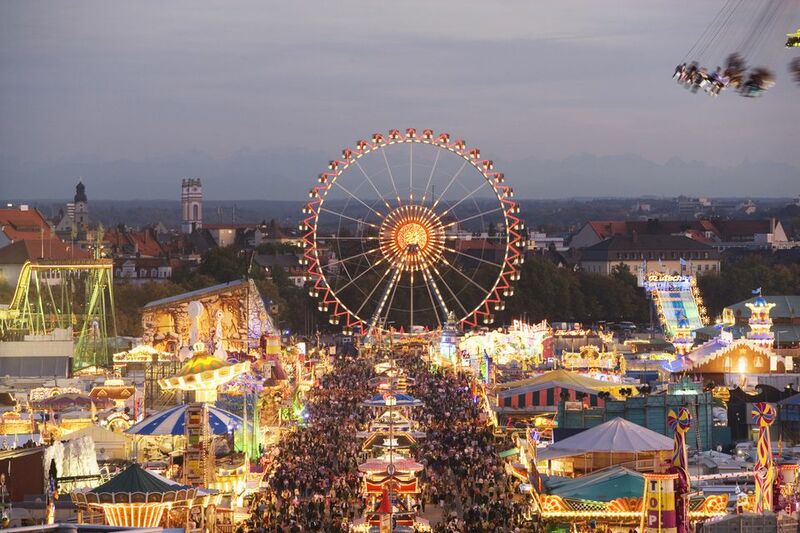 Oktoberfest, the world's largest fair, has over 6 million visitors annually. Celebrate in 14 different beer tents and enjoy Bavarian “Schuhplattler," alphorn players, and yodelers. If you aren't in town for the fest (or one of the smaller, more local beer festivals), visit the Hofbräuhaus in Munich, the most famous beer hall in the world. This Bavarian institution has defined gemütlich (“comfy”) since 1589. Wash down Bavarian specialties and giant pretzels with beer that is only served in a Mass (one-liter glass). Cologne's Cathedral (Kölner Dom) is one of Germany's most important architectural monuments and the third tallest cathedral in the world. It took over 600 years to construct this Gothic masterpiece. When it was finally finished in 1880, it was still true to the original plans from 1248. When Cologne was leveled by bombings in World War II, the Cathedral was the only building that survived. Standing tall in an otherwise flattened city, some said it was divine intervention. A more realistic explanation is that the cathedral was a point of orientation for the pilots. In any case, the cathedral still stands next to the city's train station and beckons visitors from around the globe. On the banks of the Moselle River lies Trier, Germany's oldest city. It was founded as a Roman colony in 16 B.C. and became the favored residence of several Roman emperors. Nowhere else in Germany is the evidence of Roman times as vivid as it is in Trier. Highlights of the city are the Porta Nigra, the largest Roman city gate north of the Alps, and the Cathedral of Trier, which houses a holy relic that draws many pilgrims: the Holy Robe, the garment said to be worn by Jesus when he was crucified. If you imagine Germany with rolling hills, small villages, and lush forests, visit the Schwarzwald (Black Forest), where you can experience it all. The vast expanse of hills, valleys, and forests stretches from the posh spa town Baden-Baden to the Swiss border, covering an area of 4,600 square miles. Walking, biking, or driving — there are many scenic routes that will lead you to tiny villages, such as Freiburg with its long red sausage, wineries, and old-world monasteries. Two of the most recommended tours are the Wine Road and the German Clock Road, which traces the history of the cuckoo clock. For Christmas, visit Gengenbach which becomes the world's largest advent calendar house. But remember: No visit to the Black Forest is complete without a piece of Black Forest Cake, with chocolate, cherries, cream, and a good dash of cherry schnapps. The Dresden Frauenkirche, the Church of Our Lady, has a moving history: In World War II, when air-raids wiped out the city center of Dresden, the grand Frauenkirche collapsed into a 42 feet high pile of rubble. The ruins were left untouched for over 40 years as a reminder of the destructive powers of war. In 1994, the painstaking reconstruction of the church began, almost completely financed by private donations. In 2005, the people of Dresden celebrated the resurrection of their Frauenkirche. The Romantic Road is Germany's best scenic route. It leads you through a region that boasts quintessential German scenery and culture, castles, charming medieval towns surrounded by walls, half-timbered houses, historic hotels, and restaurants that offer hearty German food and great beer. Highlights along the Romantic Road: the picturesque Rothenburg ob der Tauber, the best-preserved medieval town in Germany, and the end point at castle Neuschwanstein. German Christmas Markets are the embodiment of the holiday season. Bundled up visitors sip Glühwein beneath strings of lights as they shop amongst the wooden stalls, picking up beautifully handcrafted gifts. There is a Christmas tree and singing and so much wonderful food. One of the best Christmas markets is in Nuremberg. The market opens in November, turning the city into a magical winter wonderland. Stroll through this open-air market with its 180 wooden huts festooned with red and white cloth, lights, and fresh garlands. There is also a Christmas market just for kids, featuring a steam train and nostalgic carousels. A magical moment for young and old is the procession, where over 1,500 Nuremberg kids join in a lantern procession parading up to the castle on the hill.